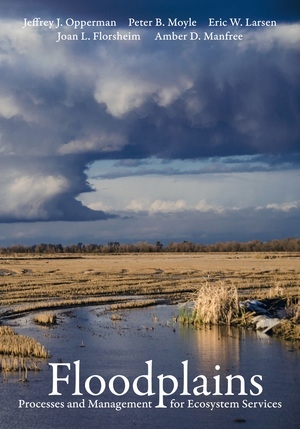 Floodplains provides an overview of floodplains and their management in temperate regions. It synthesizes decades of research on floodplain ecosystems, explaining hydrologic, geomorphic, and ecological processes and how under appropriate management these processes can provide benefits to society ranging from healthy fish populations to flood-risk reduction. Drawing on the framework of reconciliation ecology, the authors explore how new concepts for floodplain ecosystem restoration and management can increase these benefits. Additionally, they use case studies from California’s Central Valley and other temperate regions to show how innovative management approaches are reshaping rivers and floodplains around the world. Jeffrey J. Opperman is the global lead freshwater scientist for WWF and a research associate at the University of California, Davis. Peter B. Moyle is Distinguished Professor Emeritus in the Department of Wildlife, Fish, and Conservation Biology and Associate Director of the Center for Watershed Sciences at the University of California, Davis. Eric W. Larsen is a research scientist and fluvial geomorphologist in the Department of Human Ecology at the University of California, Davis. Joan L. Florsheim is a researcher in fluvial geomorphology, hydrology, and earth-surface processes at the Earth Research Institute at the University of California, Santa Barbara. Amber D. Manfree is a postdoctoral researcher in geography at the Center for Watershed Sciences at the University of California, Davis.